The easy to use, online Family History Tool can help you identify appropriate patients for hereditary cancer testing before your patient’s scheduled appointment. 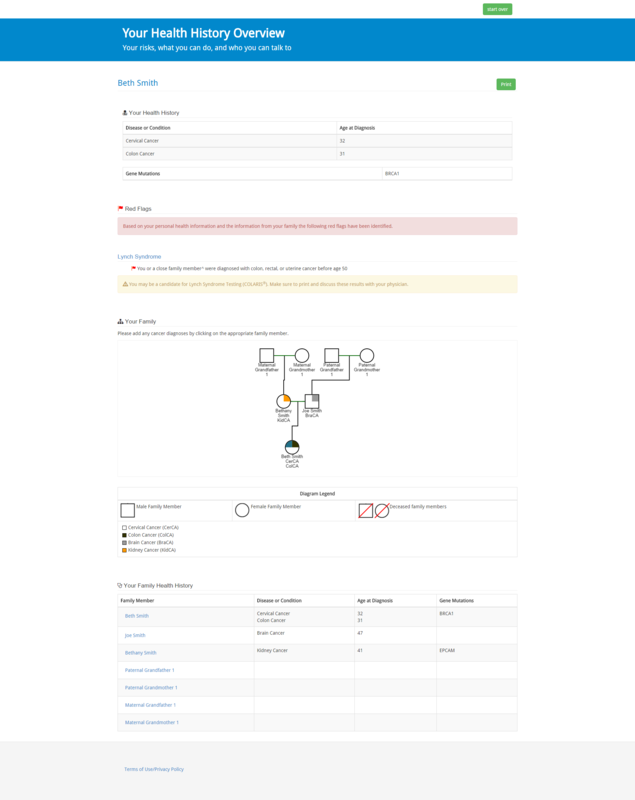 This tool can help you identify patients for testing, but it does not take the place of a full screening. All patients should be further evaluated to determine whether testing is appropriate. You can request your own custom version of the Family History Tool for your practice. This tool is completely free for you to use and helps you identify appropriate patients for hereditary cancer testing. Each custom version comes with a unique url and embed code. You will also be able to indicate how you would like to receive the Family History Tool results – secure email, print in the office or both. Once you get your custom version, you can direct your patients to the quiz in several ways. A few ideas are listed below. Post it to your website and ask patients to complete it before they come in for an appointment. New patients as well as survivorship patients are appropriate for this. We understand that patient privacy and security is very important, therefore, Myriad Genetic Laboratories has taken significant steps to make sure that the Family History Tool protects patient information. Once you receive the result notifications via email, you will need to click on “View Message”. A secure mailbox will then open. 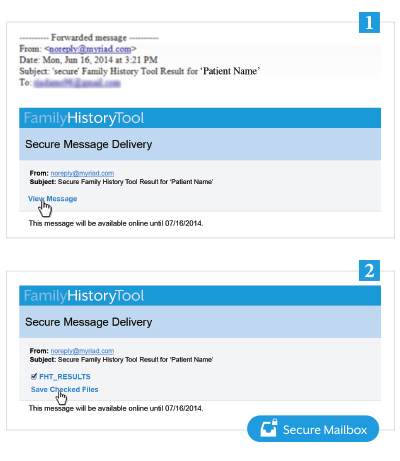 Next click on the file labeled “FHT_RESULTS” to view a patient’s Family History Tool results. You may also save a patient’s results by checking the box next to the file and clicking “Save Checked Files”. To help identify and easily sort your quiz results, we have included the patient name in the subject line of the email. To receive a custom version of the Family History Tool, please fill out the contact form on the right. Upon completion of the form, a field representative will be notified to finish the set up process and send you your unique url and embed code. If you have not heard from anyone within a few days, please feel free to contact us to finish the process at contactus@myriad.com. If you are an advocacy group or other organization that would like to use this resource, please contact us at contactus@myriad.com and we would be happy to set up a custom version for you.